Watch this video to know about your daily wellness routine for healthy weight loss and weight management with Oriflame Wellness products! I recommend this daily wellness routine for all women. Health is a very important area of our life. When we are healthy we can enjoy life even more. To stay healthy we must follow a daily wellness routine. As an Oriflame consultant we have to be a role model for others in our team and also our customers! Your daily wellness routine can include brisk walking, exercise, yoga, dietary supplements like Omega 3 capsules and healthy food. The most important meal of the day is the breakfast. You must include Oriflame Nutrishake in your breakfast as it gives you enough nutrition to give you a good start. Along with your Nutrishake if you have 1 Oriflame Beauty complex capsule. Oriflame Swedish beauty complex Plus gives moisture and elasticity to make your skin more beautiful and young from within. 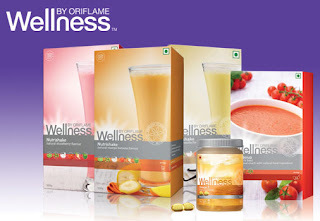 At night you can have the wellness soup by Oriflame. This soup can also help those who want to do some weight loss. If you replace your diner with salad and Oriflame wellness soup, you can lose weight fast. Many Oriflame Consultants in Bangalore and Mysore are doing this and getting very good results. I recommend all Oriflame consultants to regularly consume Oriflame Nutrishake, Astaxanthin capsules and Nurtisoup to stay healthy and beautiful. Also recommend the same to all your friends and family members. So when you are placing your next order on the Oriflame website, don't forget to add these Oriflame wellness products to your basket. Every month when I buy Oriflame products online from my Oriflame account I always include wellness products.